Murphy Burr Curry provides the full range of consulting structural engineering services, with an emphasis on historic renovation, seismic retrofit and new building design. Working with architects, developers and contractors, we create innovative and cost-effective engineering solutions to solve even the most complex structural design problems. 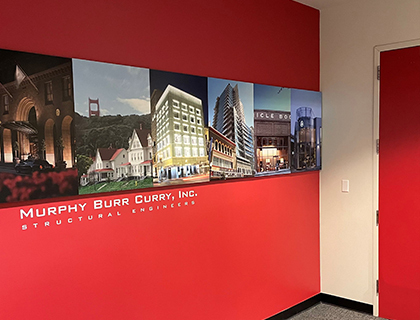 Based in San Francisco, Murphy Burr Curry is recognized as a leader in the evaluation of buildings damaged due to natural disasters such as major earthquakes, fires and storms. Murphy Burr Curry also specializes in the seismic upgrades of existing structures. Founded in 1997, Murphy Burr Curry brings a highly professional, practical yet innovative approach to the complex world of structural engineering design. Property owners, architects and contractors rely on us to devise appropriate cost-effective solutions for both the design and construction of new buildings and the rehabilitation of existing ones. We also provide consulting services that include due-diligence and the evaluation of existing structures. Our project encompass the creation or expansion of retail and commercial spaces, residential structures, medical facilities and academic institution, and the renovation of historic buildings of all types and sizes because of our location in San Francisco, we are recognized as leaders in the assessment of buildings that have been damaged due to earthquake, fire and flood, and specialize in the seismic upgrades of existing structures in our first five years alone, we have completed over 1,000 projects in locations throughout the United States.